Please register to help us guide the conversation toward YOUR interests. Join us for Friday morning coffee conversations October through December (11:00 am – 12:00 pm) for ongoing, campus-wide, Learning Management System future-ready discussions and presentations at the Orange Campus Tech Hub, DeMille 104. 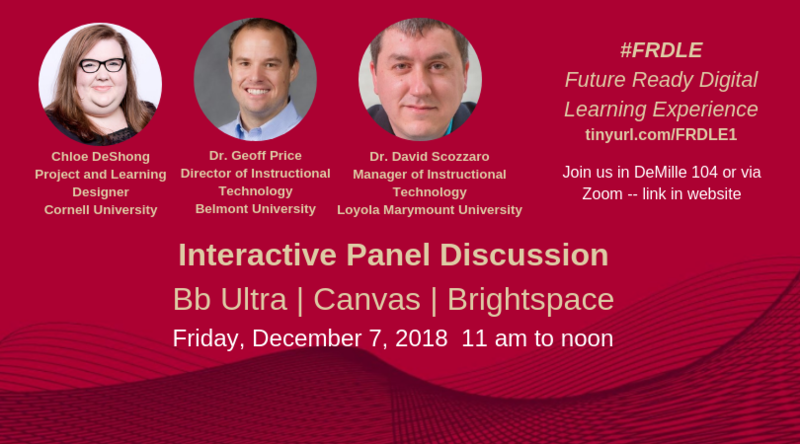 In these open forums, we will be discussing Blackboard Ultra and other future ready learning management systems. On weeks there will not be a panel discussion, there will be sandbox demos and other hands-on activities. An up to date schedule of events and curated resources can always be found at the Educational Technology Service FRDLE site: https://sites.chapman.edu/chapman-lms/ All of sessions will be live streamed and only presentations recorded through Zoom web-conferencing.